Eskadron dressage boots allow freedom of movement for the fetlock joint guaranteed by means of the specially moulded form at the front. The elasticated border not only improves the foot optically, it also adjusts well to the horse's sequence of movement. In black or white in full and cob size. For ponies see Pony Boots. 3 stars I was looking for a tough boot, as many I've tried had real or fake leather; neither seemed to hold up. I haven't had them long enough to test their durability. 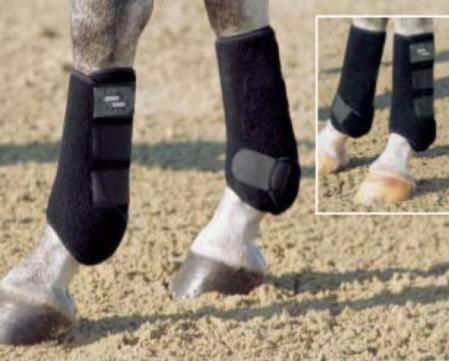 I was worried that the covering of the fetlock would interfere, as I think happened with the sports medicine boots of years ago, but it doesn't seem to be a problem. Getting used to the super sticky Velcro. 5 stars Absolutely love these boots. They wash really, really well. They are big enough to fit my clydie cross vaulting horse. Equestrian Haus delivered a fantastic product, I received it promptly and considerably cheaper than if I had bought it here in Australia. THANKYOU, THANKYOU. You can be sure that I will be a repeat customer.